Live in harmony with your backyard! Birds aren’t the only ones that can use your yard to their benefit. Anything from Deer to tiny Tree Frogs can inhabit your yard to and use its resources. Here are some of the general wildlife you can see in your yard. Alligators are long-lived animals whose life spans can exceed 60 years. Alligators are “cold-blooded,” meaning that they are ectothermic animals that cannot regulate their body temperature, but assume the temperatures of their surrounding environment. To warm themselves, alligators bask in the sun, which is when they are frequently observed on the banks of water bodies. On hot summer days, they can sometimes be seen basking with their mouths open. This is a cooling mechanism essentially equivalent to a dog panting. Ecologically, alligators are important predators and create important habitat for other wildlife by digging holes that hold water during droughts. Alligators live in swampy areas, rivers, streams, lakes, and ponds. Females and juveniles occasionally use seasonal wetlands. 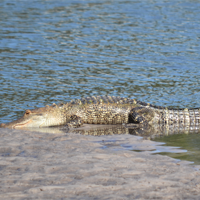 Although they are primarily freshwater animals, alligators will also venture into the brackish salt water. Broadhead skinks are the largest skink in the southeast, and with the exception of the glass lizards, are the largest lizards in our region. 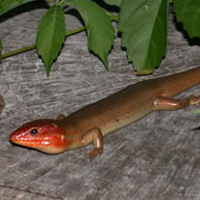 These large lizards have short legs and a streamlined body. The body is gray, brown, or black, in background color with five white or yellowish stripes (two on each side and one down the center of the back). However, adults often fade to uniform gray or brown, and mature males develop enlarged orange heads with powerful jaws. Like other skinks, the young have bright blue tails and prominent stripes. Although they may be found both on the ground and in trees, broadhead skinks, particularly large males, are more arboreal (tree-dwelling) than any of the other southeastern skinks. Adults are often seen high up in trees, sunning on exposed branches, while young are common on fallen trees and under bark or other debris. When pursued, broadhead skinks run for the nearest tree or log and can be quite difficult to capture. Like many other lizards, broadhead skinks will break off their tails when restrained, distracting the predator and allowing the lizard to escape. As a member of the spiny lizard family, the Fence lizard is the only lizard native to Georgia and South Carolina that has rough scales. 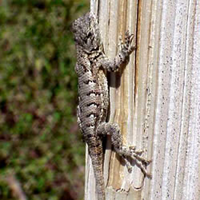 Fence lizards are most commonly grayish in color, but may range from nearly black to brown. Females often have black horizontal patterning on their back, while during the breeding season, males have bright blue patches on their chin and underside. Although sometimes found on the ground, fence lizards are one of our most arboreal (tree-dwelling) lizards and usually dash for the nearest tree when approached. When pursued, the fence lizard will stay on the opposite side of the tree from the predator, in the same fashion as a squirrel. Glass lizards are long, slender, legless lizards that superficially resemble snakes. They differ from snakes, though, in that they have moveable eyelids, external ear openings, and inflexible jaws. The eastern glass lizard is the longest and heaviest glass lizard in our region and is light brown or yellowish to greenish in coloration. 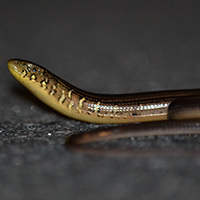 This species is best distinguished from other glass lizards by the absence of a dark dorsal stripe or dark markings below the lateral groove and the presence of several vertical whitish bars just behind the head. Older individuals are less boldly patterned than younger individuals, often developing a greenish or speckled coloration. Glass lizards forage actively by day in open habitats but are commonly found taking refuge beneath boards and other debris. When seized, glass lizards commonly break off all or part of their tail (which makes up more than half of their total length) and will later regrow. With the predator distracted by the wriggling tail, the lizard is free to escape. Five-lined skinks are moderately large lizards with short legs and a streamlined body. The body is gray, brown, or black, in background color with five white or yellowish stripes (two on each side and one down the center of the back). Young have a bright blue tail while adult males often loose their stripes and develop reddish or orange coloration on the head. 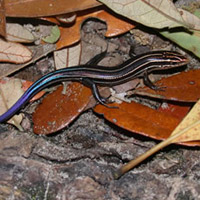 Five-lined skinks may be found on the ground or in trees, but are less arboreal (tree dwelling) than broadhead skinks. Although sometimes seen in the open, these lizards are most often found beneath logs or under tree bark. When pursued, five-lined skinks run for the nearest tree or log and can be quite difficult to capture. 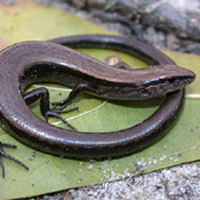 Like many other lizards, five-lined skinks will break off their tails when restrained, distracting the predator and allowing the lizard to escape. May be either green or brown depending on environmental conditions. When brown, may have faint markings on the back. Males have a pinkish throat fan that is displayed in territorial rivalries or when approaching a potential mate. The green anole is most easily distinguished form the similar brown anole (Anolis sagrei) by green or lightly patterned brown coloration, pinkish throat fan, and by range. 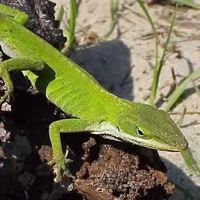 Anoles are active by day in warm weather and often bask in vegetation, occasionally charging away from a basking spot to grab and inset or chase off a rival anole. During cool weather, anoles are often found hiding under tree bark, shingles, or in rotten logs. Sometimes many anoles can be found taking refuge in one spot. Ground skinks are small, slender lizards with long tails and short legs. They range from golden brown to almost black in coloration but are most often coppery brown with a darker stripe running along each side of the body. The belly is white or yellowish. Unlike many other lizards in our region, ground skinks virtually never climb. Rather than running on their tiny legs, ground skinks use their slender bodies to wriggle or “swim” through leaf litter or loose soil, often disappearing in a flash as soon as they are discovered. Like other lizards, ground skinks will break off their tail to confuse a potential predator. Southeastern five-lined skinks are moderately large lizards with short legs and a streamlined body. The body is gray, brown, or black, in background color with five white or yellowish stripes (two on each side and one down the center of the back). Young have a bright blue tail while adult males’ stripes may fade, and a reddish, or orange coloration may develop on the head. 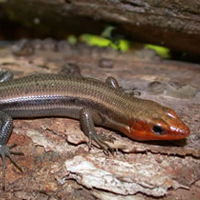 This species is very similar in appearance to the five-lined skink and broadhead skink and is usually only identifiable by close examination of the scales: unlike the other two species, southeastern five-lined skinks do not have an enlarged row of scales under the tail. Southeastern five-lined skinks may be found on the ground or in trees, but are less arboreal (tree dwelling) than broadhead skinks. Although sometimes seen in the open, these lizards are most often found beneath logs or under tree bark. When pursued, these lizards run for the nearest tree or log and can be quite difficult to capture. Like many other lizards, southeastern five-lined skinks will break off their tails when restrained, distracting the predator and allowing the lizard to escape.